Hi Rachael, really interesting talk – thank you. I’ve tried to find “Textdebate.com”, but I can’t find it. Did I hear you correctly? Ah, sorry, not it’s textivate- should have put it on the slide! A wonderful presentation. I couldn’t agree more. This was really interesting and thought provoking Rachael. 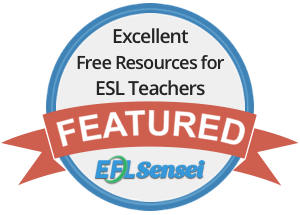 You’ve hit on a really important area for teachers who like to provide some semblance of structure for their learners but want to add, alter and embellish published material. As I’ve become more experienced I’ve used ideas and materials from several sources adapting them for whoever is in my group but in the early days course books were essential and I think this is the same for many teachers. There are some excellent books with interesting and useful materials so why not use them. Someone has spent a lot of time getting them right after all. Yes, I completely agree. Fine if you don’t want to use published materials, or want to make your own, but why make it a moral stance when there are also clear benefits to using them? A good point and many nice ideas. Thanks!